Magnus Carlsen continues to lead the 2014 World Championship match by a point with two games to go after a draw in Game 10. The encounter followed the trajectory of Game 5 almost to the letter. 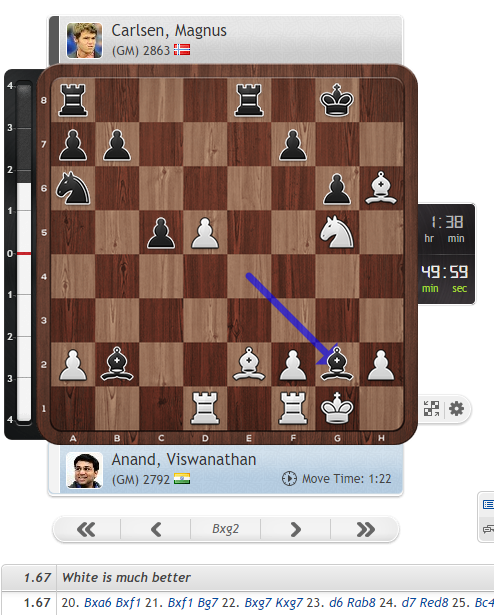 Carlsen, playing Black, moved faster and seemed better prepared than Vishy Anand in the opening, but then ran into problems that all but forced him to bail out into a tricky queenless middlegame. Vishy looked in top form in both encounters, until he stumbled and, when it seemed he could still keep pressing for hours at little risk, he forced a rapid draw. 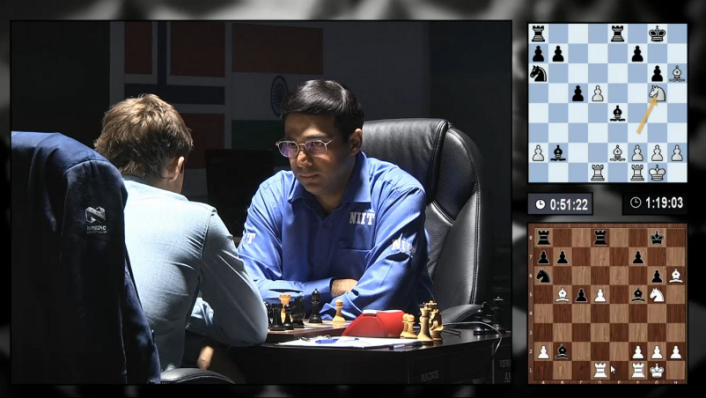 Carlsen: Today it’s definitely a very interesting position to delve into. As a chess player you like that. ...but both also resorted to a phrase typical of the computer age: "It needs to be checked". I somewhat underestimated 19.Ng5, but after Ng5 I didn’t find it easy at all. With the two bishops he does have some pressure... I was relieved when he gave me the e-file because then I felt my problems were solved. Probably not with the media there. But just after that, as they were preparing to leave, Vishy could be heard to ask, "What is it, a cocktail?" Carlsen had to explain, "No, no, it's..." with flailing arms. Actually it is also a cocktail, but the following video, where the yoga instructor speaks English, will make things clearer - as well as answering the burning question: "Who's the most flexible person in Team Carlsen?" The players have a rest day after each game now, so the teams will have time to hone their weapons for the absolutely critical Game 11 on Sunday. Carlsen will retain his title with a win, but any other result will see the match go down to the wire. In the meantime why not check out another match! The Showdown in Saint Louis between American and Armenian number ones Hikaru Nakamura and Levon Aronian starts at 21:00 CET. The commentary team will be the same one that featured in the Sinquefield Cup earlier this year, so it's guaranteed to be a great show. Watch it on our live broadcast page!